“It's still the same shop, it's just very, very small,” says co-founder Caleb Barney, who began the company with his wife, Hillary, in 2010. Barney closed the store at the end of September with little fanfare; he says their customers were shocked. Barney attributed most of the moving decision to cost -- the new space's expenses will amount to around a tenth of running the old one. The new ArtSpace location (423 W. 800 South) will also have limited hours and will be open to the public only on Fridays and Saturdays. 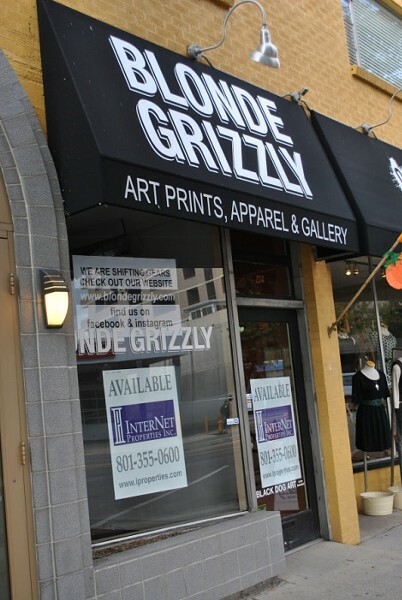 But customers will have more offered to them through upcoming changes and improvements to the Blonde Grizzly online store. Black Dog Art, a local folk-art store that previously occupied Blonde Grizzly's basement, will also be making the move with Blonde Grizzly.